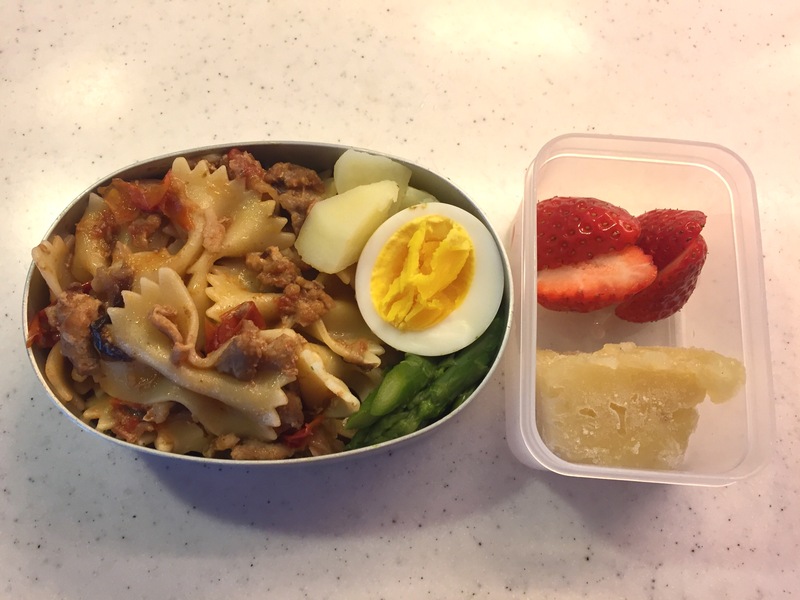 Today’s lunch was farfalle pasta with the pork & radicchio ragu which was the leftover from the dinner the evening before. I improvised the recipe using the generous amount of pork slices we received from our dear friends, a lovely family who live next door with whom we became friends through our daughter’s school. They apparently received a huge amount of pork as gift (quite common in Japan to send food as gift), and they kindly shared some with us. Apart from the pork, there was some leftover radicchio I used for salad the previous day and some cherry tomatoes in the fridge. The three ingredients reminded me of this simple yet highly tasty radicchio risotto I once ate in a small Italian city of Marostica, possibly more than ten years ago. It was the first time for me to eat cooked radicchio – it was delicious with some bitterness and hint of buttery & nutty flavour. And I remember the colours – this dark shades of red sauce on my plate, contrasting beautifully with the white of grated parmiggiano, and opaque steam coming out of the freshly cooked risotto… a divine dish. The taste came out quite differently for my sauce however, because I used a lot more pork than I can remember from the risotto I had eaten years ago. That’s why I served it with pasta rather than rice, since I thought the meaty flavoring was a bit too heavy for risotto. Nevertheless it turned around to be great ragu, and moreover I enjoyed trying to replicate the dish I had tasted years ago on my own, this time for my dearest family. When I was growing up, my mum never packed pasta for lunch. Maybe sandwich if not rice, but never ever pasta in my recollection. In fact my mum hardly ever cooked pasta as it wasn’t as popular and widespread as it is now. As far as pasta is concerned, I remember my mum’s macaroni salad (i.e. macaroni mixed with sliced cucumber, carrot and ham, seasoned with mayonnaise) and Spaghetti Napolitan (i.e. spaghetti with bacon, green pepper and onion, seasoned with tomato ketchup – no idea why it’s called Napolitan though). That’s about it. I remember going to this brand new, rather posh cafe/restaurant with my mum and sister in our neighbourhood in the suburban city of Gumma (where I grew up), ordering some pasta with very exotic names such as “Spaghetti Monte Mare (combination of mushroom & seafood)” or “Spaghetti Basilico (prepared with Japanese shiso herb instead of real basil because basil just didn’t exist at that time in Japan).” Considering how limited the options used to be for Italian dishes, it is incredible how authentic Italian cuisine has become over the years in this country. About ten years ago I lived in Italy for over a year, and I fell in love with Italian pasta. I actually lived on it during my stay there. And now I cook pasta all the the time since I often get this craving for it. My daughter, being fed by me on a daily basis, loves pasta as well. When I ask her what her favorite food is, she always answers, “PASTA!,”not rice. 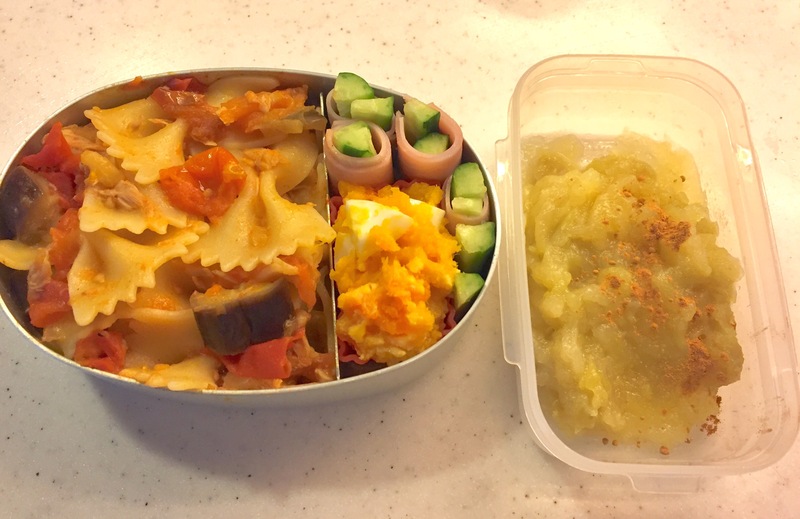 Being Japanese, I feel somehow neglected by my own daughter, but the good food is universal, and so is the content of my daughter’s bento.